Every two years the Taipei Aerospace and Defense Technology Exhibition (TADTE) is convened as a showcase for the country’s high tech sector. Although the civilian firms participate in large numbers a greater spotlight is shone on whatever new armaments and military subsystems are debuted at the venue. 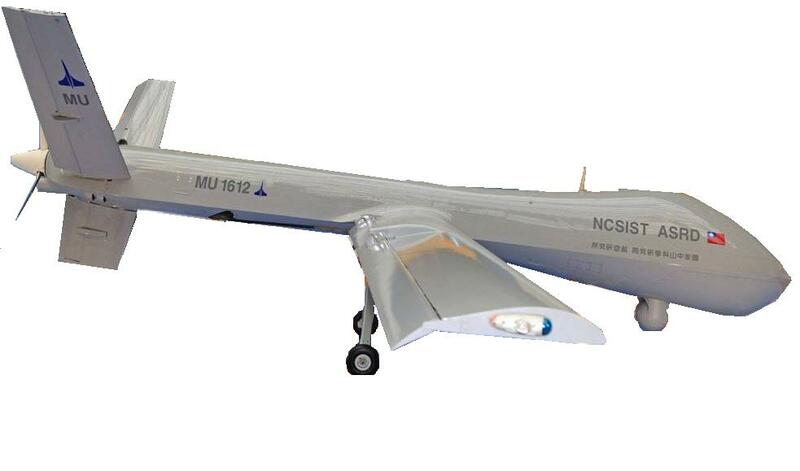 This year’s TADTE, held from August 13 to 16 at the Taiwan World Trade Center Exhibition Hall 1, grabbed attention for what appeared to a be a mock-up of a MALE UAV resembling the General Atomics Predator. Striking similarities like its v-tail, tricycle landing gear, and familiar nose blister, suggested Taiwan was getting serious about its indigenous drone business. According to available open sources the drone is called the ASRD and was developed by the National Chung-Shan Institute of Science and Technology (NCSIST). 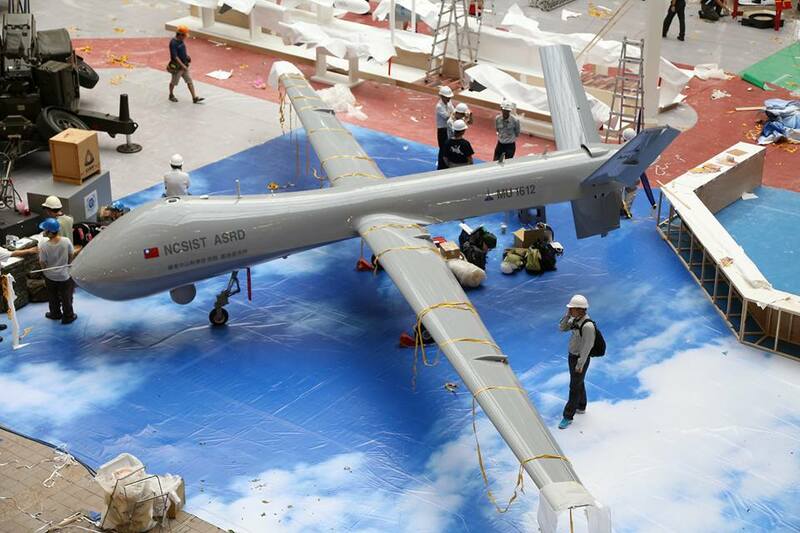 The Taiwanese flag and the acronyms “NCSIST ASRD” were printed on either side of the drone’s nose. Officials were mum on detailed specifications for the ASRD. Hence, reader take note, the bulk of this post contains musings of a speculative nature. This doesn’t mean the ASRD’s capabilities are impossible to ascertain. Its shape alone reveals its purpose–long-range high-endurance flights, the type that could last beyond 24 hours covering areas 500 or 600 kilometers away. But these figures are rounded off assumptions of its performance on paper. If insistence deserves a proper response, then let it suffice that the ASRD’s dimensions are a matter of guesstimation. Going by the measurements of other drones like it, for example, its length couldn’t possibly exceed 30 feet. Judging by its photos, the wingspan measures beyond 30 ft but less than 40 ft.
Side view of the ASRD. Although the ASRD does inspire thoughts of Taiwanese killer drones cruising over disputed waters to the east and south of the island nation’s coasts it deserves mention Taiwan, as a budding drone power, is rather late in the game. Bear in mind the UK, France, Italy, Turkey, Israel, Iran, and even China have made the effortless technological leap toward building MALE drones years ago. Furthermore, the ASRD’s appearance suggests it won’t be packing laser-guided ordnance on kill missions any time soon. Here’s why. First, the dimensions of the ASRD’s v-tail, which is attached to its engine compartment, are too small. This suggests space adequate for just a turbopropeller engine with a horsepower ranging from 100 to 150 and definitely less than 200. Should the ASRD need to mount Hellfire missiles (Taiwan’s military flies AH-64D’s, which means Hellfires are in its arsenal) and smart bombs then the additional payload and fire control system requires a much larger engine in the 900 to 1,000 horsepower range. If the ASRD in its current iteration is to be armed it needs a better engine for at least a pair of missiles, one on each wing. Both Iran and Pakistan‘s drone manufacturers understood this engine and payload correlation, hence their successful adoption of armed drones. 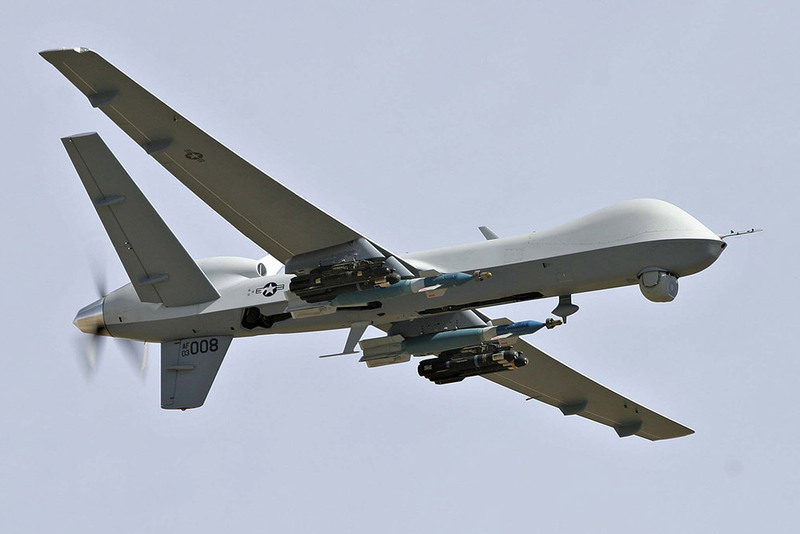 The General Atomics MQ-9 Reaper. Second, since details about its avionics haven’t been divulged, the ASRD must be devoid of a fire control system. Given the shape of its nose and the gimbal underneath it, it’s safe to assume the ASRD–no different from a Hermes or a Watchkeeper–carries avionics for in-flight stabilization and target tracking plus a radio, a radar, an infrared/thermal camera, and a GPS tracker. Third, given Taiwan’s longstanding preoccupation with China an armed UAV won’t have any great impact on the current balance of forces. In a hypothetical future conflict deploying it over the Taiwan Strait will leave it vulnerable to sabotage via jamming and interception by aircraft or air defense systems. The current use for armed UAVs, being American innovations, are restricted to hunting terrorists in remote areas. Yet how did Taiwan acquire the technology to build its own Predator-esque drone? Even if Taiwan is a loyal customer of US weapons and technology MQ-9 Reaper exports are tightly controlled. There is little to no possibility that the ASRD is licensed from General Atomics. Besides, its maker the NCSIST isn’t an obscure government-funded think tank. 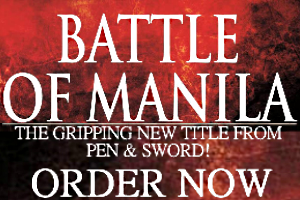 It R&D’s an impressive selection of weaponry and gear. It’s also responsible for developing the local aerospace industry and Taiwan’s premier fighter jet, the twin engine Chung Kuo. Taiwan’s diversified economy includes local electronics and optronics sectors so sourcing the ASRD’s parts–along with its fuselage made of composite materials–aren’t a problem. Drone technology isn’t overly complex either. The Iranians built their own industry with just persistence, constant tinkering, and the importation of dual-use parts. Taiwan’s government does have ties with Israel though. (Well, so does China.) As the world’s leading purveyor of drone tech, the ASRD may reflect collaboration with Israel. Besides, its resemblance to the Hermes 900 is quite obvious. Lacking credible sources to support claims of a Taiwan-Israel drone pact means the idea could never go beyond wild speculation. 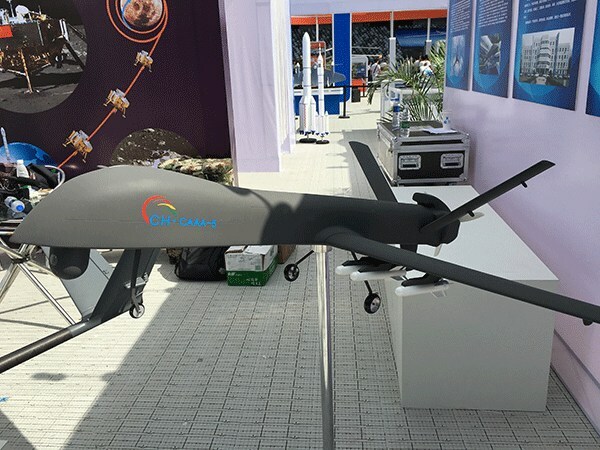 A mock-up of the CH-5, a drone manufactured by CASC, was on display at the International Unmanned Vehicle Systems trade fair in Shenzhen from November 17 to 20. Note the trio of missile hardpoints on the wing. An earlier armed variant called the CH-4B was sold to Iraq in mid-2015 and these have been flown on combat missions. Photo via Ministry of National Defense. But what possible use for the ASRD can Taiwan have when its armed forces already have surveillance drones like the twin-boom Chung Shyang similar to the Israeli-made Heron? The benefits of having MALE UAVs are simply enhanced performance and a greater range for ISR activities. Taiwan might not be threatened by terrorism but its needs in the Taiwan Strait and the South China Sea could be met by MALE drones. After all, even Japan went as far acquiring US-made Global Hawks to monitor Chinese movements in its maritime borders and disputed islands. Indeed, China. By comparison, Taiwan’s big neighbor does possess an enormous UAV fleet and exports armed and unarmed drone variants to whoever can pay for them. Taiwan’s best response are drones of its own. For a platform that may beget a lineage of unmanned aircraft in the medium-term, the ASRD could have a promising future.